This is the time of year when I like to have some easy, go-to meals put away in the freezer for quick lunches or suppers with no hassle. This is one of our favorite recipes to stock up our freezer with. You will need to prepare a recipe or two of a basic bread dough. You can use your favorite recipe for this! I like to grind my flour fresh and make a whole wheat dough. I use this recipe for my basic, whole wheat dough. Once your dough is made, you will need to roll out your dough to make a large rectangular shape. Think about making cinnamon rolls! You will want approximately the same size and shape. 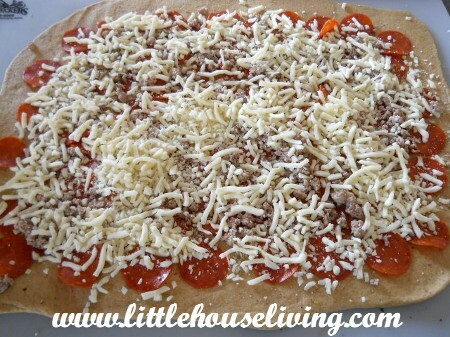 Once your dough is rolled out, I usually use turkey pepperoni to cover the surface and a shredded raw cheddar cheese. You can add in anything you would wish at this time, just remember not to get them too overloaded or they won’t stay together as well with a lot of “insides”. I did use a small amount of sausage that I had leftover that was already browned and ready to use, also. I also sprinkle a small amount of my pizza seasoning over the entire surface. 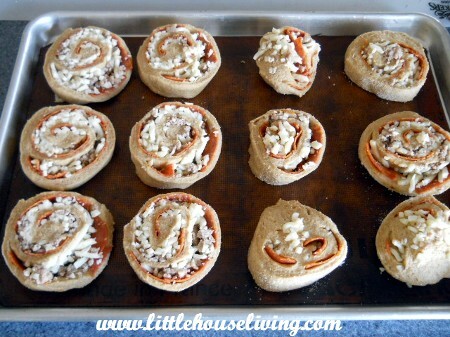 Once you get the ingredients all spread out over your dough, you will begin to roll it up in a tighter, cylinder form. 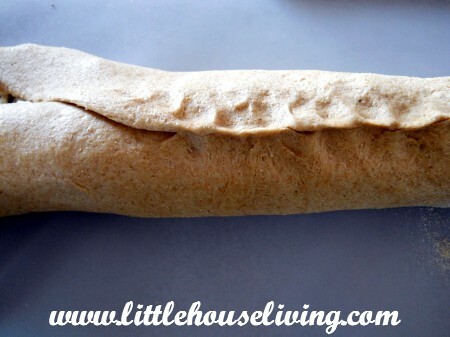 Continue rolling until you come to the other side of your rectangular dough and pinch the dough together to form a seal. You can also fold in the ends, so the filling doesn’t come out. 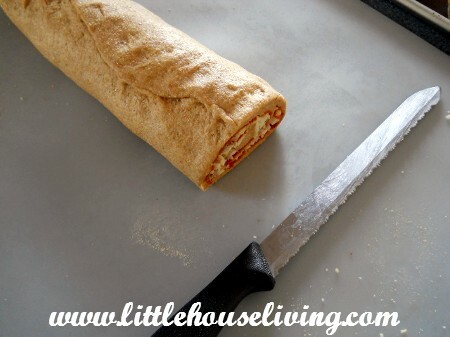 You will then cut your roll into slices. I usually cut mine about 1 – 1 1/2 inches wide. Cut the complete roll. Place the rolls on a greased or covered cookie sheet on their sides (as shown). They are ready to bake…you don’t have to allow any time for rising at all. Bake the rolls in a 350 degree oven for approximately 25 minutes or until cheese and dough is golden brown on top. Let cool and enjoy! They are great right from the oven or re-heated later. They are also ready to put in ziploc freezer bags and store for a later meal. They freeze wonderfully and you can just re-heat to eat right from the freezer. If you like sauce, you can dip them in pizza sauce as you eat them. Half of my family enjoys them plain, while the other half likes to dip in my homemade canned pizza sauce. Merissa, This recipe looks awesome. It would be something my husband would take to work with him. He only takes things he can eat while driving. I did go to the basic dough recipe and see that it calls for lecithin. I know that lecithin is good for you (really good for you), but wonder if it is essential to the dough. Does it add to the quality of the bread? Can you taste it? 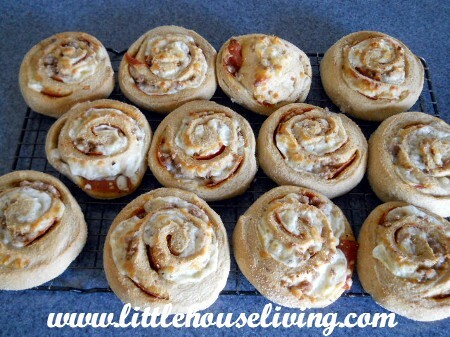 Hi Noreen….Merissa’s mom here…since I wrote the post and make these pizza roll ups regularly. 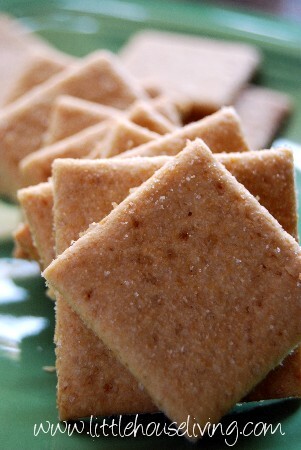 The lecithin doesn’t add any additional taste to it. Lecithin is a binder, so it just helps everything to work together to make a nice, soft, easy to work with dough. If you use a “dough enhancer” of any type, this could be in place of the lecithin. If you don’t have it, you can leave it out. If you need another recipe for a basic dough, I have another good one that I can share. It is a very soft dough, using milk, as one of the ingredients. I have used it several times, also, and it makes a nice, easy to work with dough, without any extra ingredients that you might not have. Let me know and I can put together a post for that, if you would like. Ok. I love learning and I am learning now! What are other dough enhancers? I regularly add gluten to my bread dough. Does that count? I would love to have another recipe for basic dough. I am finally able to be home and love bread baking, and my chickens, and my garden…need I go on? Thanks to both you and Melissa for this website. It is packed with great stuff. Sometimes it takes another person to do and show us new things we would not have thought about trying. I’ve made pizza for years and never thought about rolling it up!!! Anxious to get this made and have some in the freezer too. I made this today, awesome! Thank You! This looks *AWESOME*! I can’t wait to try it! This is on my TO DO list in the near future! Those look great! I need to start making some lunches and freezing them for the kids summer vacation. This might work! Thanks for linking up at Whip It Up Wednesday! Great idea! We have found pre-made dough at the supermarket in the deli case. When I don’t have time to make the wheat dough, I can fall back on the premade dough. This recipe is a wonderful idea. I am a big fan of make ahead and freeze for later meals!!! Thanks for sharing. We cook these before they go in the freezer so when you take them out just warm them up and they are ready to go! Yum! Maybe I can get these to replace hubby’s craving for Totino’s. Do you freeze these as soon as theyre made or do you let them rise first? We let them rise and cook them before freezing them. I usually have 2 to 3 bread machines going at the same time just making dough!!! Now I can make dinner rolls, a loaf of bread and some pizza rolls all at once… Since 3 back surgeries I don’t have the oomph! to knead the dough so let the machine do it for me…I STILL MAKE THE BREADS homemade… ha ha ha… Thanks for the great recipe!